Selected Vltava River Bridges I. The 35-metre long bridge with characteristic 6-metre high reinforced concrete arches was built by the Prague company Pittel and Brausewetter (completed in 1926). In 1987, it was declared a cultural technical monument. This covered wooden footbridge supported by three stone piers spanning the Teplá Vltava (Warm Vltava) served for catching and sorting floated timber via wooden poles (beams) lowered into the river from the bottom of the footbridge. 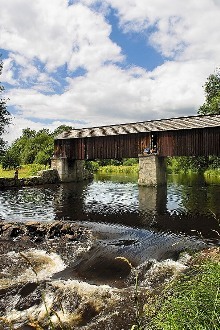 The covered bridge is 25 metres long, 1.8 metres wide and 4 metres high. It was built in 1870. This was a former ford and later bridge (today a road bridge) spanning the Teplá Vltava (Warm Vltava) on the route of the so-called Zlatá stezka (the Golden Path, a historic trade route on which salt was transported from Austria to the Czech Lands). 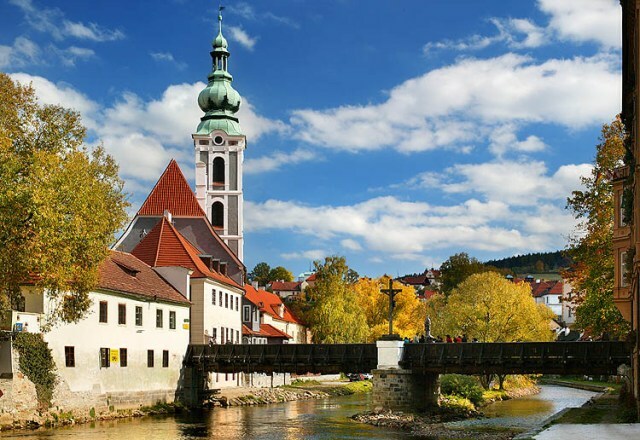 It is the starting point of boaters on the Vltava River heading in the direction of the town of Nová Pec. This is a weir with a bridge (footbridge) on the 284.9 river km of the Vltava. The wooden footbridge, 110 metres long, is covered and in the past served to catch and count floated timber (similarly like the covered bridge in Lenora). It is estimated to be more than 200 years old. This wooden road bridge connects the area named Latrán with the historic core of the town. It is ornamented with the statues of Jesus Christ and St. John of Nepomuk. The bridge offers probably one of the most beautiful views of the chateau building complex above the river. České Budějovice - a road bridge connecting the western part of České Budějovice with the centre of the town. The bridge, the way it appears today, was opened in 1998. 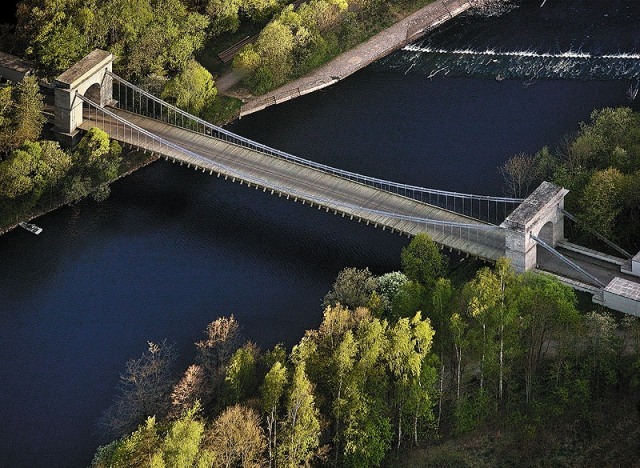 This is a steel suspension bridge standing on the location where in the 18th century a wooden bridge connected both banks of the Vltava. This historic steel bridge built in 1892, designed by Ing. Josef Mayer and manufactured by Prague Bridgeworks, stands on the location of a former wooden bridge (which probably stood here since the 1st half of the 13th century) and has two 60-metre spans with one stone pier in the middle. The 510-metre long reinforced concrete road bridge was built during the years 1937 to 1942 on the Tábor – Písek route. The elegant structure (awarded a prize in 1937 at the exhibition in Paris) consists of several arches, the largest of which spans 150 metres. The piers of the bridge, which replaced an old chain (suspension) bridge from the year 1848, have been partially submerged in the water of the Orlík Dam since 1960. This steel railway viaduct spanning the Vltava River valley was built by Prague Bridgeworks during the years 1886 to 1889 utilising the then new method called free cantilever construction, which means without the utilisation of scaffolding. The bridge is 253 metres long with three spans on two stone piers. It stands 68 metres above the bottom of the valley. This road bridge was opened (the same as its “twin” spanning the Otava River) in 1963. The bridge, constructed utilising the free cantilever concreting method (without scaffolding), is 253 metres long and stands on three piers, the middle one is 75 metres high. The construction of the bridge was commenced before Lake Orlík (reservoir) was filled and was completed only after the water level rose.